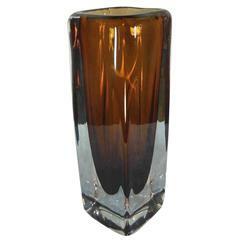 Mid-Century Modern hand blown glass vase in hues of amber. Features submerged cased glass in amber floating over a translucent base. 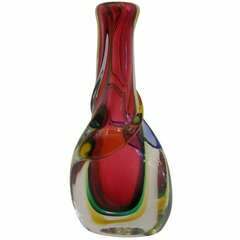 Vase has a bottle glass shape with freeform shortened stem. Very good with minimal wear. Spherical green Sommerso Murano glass vase, 1970s. Vintage Kosta Boda glass vase, dating, circa 1970s. Beautiful clear and brown color. Signed Kosta and Number on the bottom. Very heavy! Midcentury Sommerso glass vase of clear, ruby and blue colors by Flavio Poli. Gorgeous Italian art glass vase in emerald green by artist Flavio Poli. Large thick piece with magnificent color.